Grape source: Oatley Vineyard, Cannington, Somerset. Kernling upper block, vines planted 1986, cane-pruned on 90cm-high wires, vertical-shoot-positioned. and Kernling lower block, also planted 1986, cane-pruned on 150 cm wires, hanging canes. Buds were early after a warm winter but a spell of frosty nights in Apr slowed things up to a week behind normal. We had a few frosted shoots in the lower Madeleine block but only a slight loss of yield overall. The Kernling vines were unaffected. Early summer was showery but a hot spell in July finished off the fruit-set nicely. Ripening continued a little late but then a wonderful dry, warm autumn ripened the fruit fast and well and the Madeleine Angevine grapes were harvested in the last week of September, as normal. The fine autumn weather continued and the September warmth brought the Kernling ripening curve up to 2009 and 2010 levels (though the crop was smaller, which also contributed to the quick ripening). We brought the harvest date forward from the originally-forecast 30 Oct to 23rd. 23rd October, with a misty start followed by cool, breezy sun. Grapes in exceptional, clean, ripe condition. 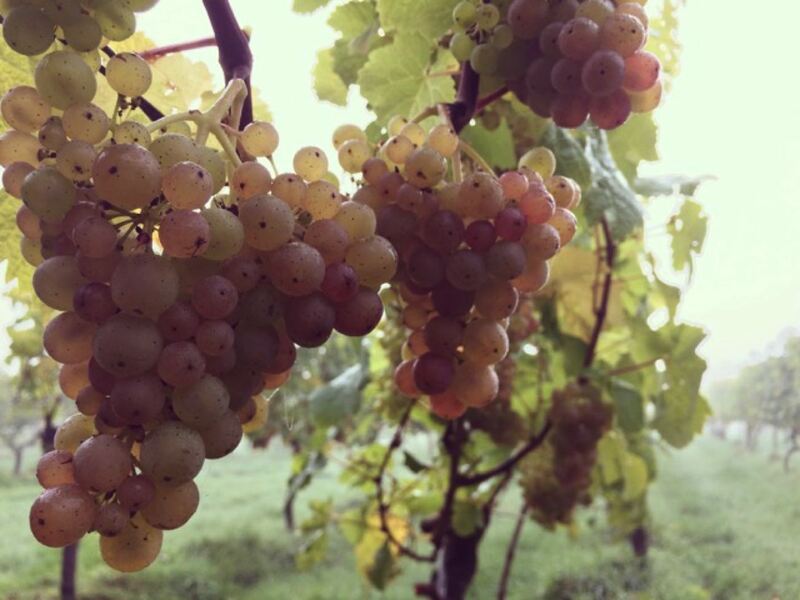 Winemaker: Steve Brooksbank, near Shepton Mallet, Som BA4 6SX. Crushing/pressing 24th Oct 2016. Free-run juice: sugar 83 Oechsle, acid 12 g/l. Vinified in stainless steel tanks. Bottled 28 Feb 2017 in lighter weight (410g) “autumn leaf” 400g 75cl Burgundy bottles sealed with high quality traditional cork. 1580 bottles made. Labelled with FSC certified Tintoretto paper.